I've been a bit quiet lately thanks to some work-related travel and some lack of hardware. But the traveling is done for the time being and some of the much-awaited hardware has arrived. It is time to get back to hacking my Davis VP2 Weather Station. 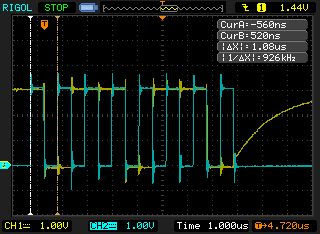 This is a measurement of the SPI traffic, courtesy of my new Rigol 1052E scope (and no, I have not hacked it yet, but I fully intend to). Yellow is MISO data and blue is SCK. This shows that the I2C clock is a pretty manageable 920 kHz, which just happens to be half the CPU frequency. Second, measurements on a wider timescale shows very little traffic. This is to be expected: the outdoor unit is essentially solar powered and you want to conserve that power as much as possible. The SPI Equivalent of "First Post"
The next thing to do is hook up my newly arrived Bus Pirate and see if I can make sense of the data going back and forth. Cool.